Rep. Tina Pickett joined members of the House Republican Caucus to announce legislation that will harness clean natural gas to create jobs throughout the Commonwealth. The “Marcellus Works” package is designed to keep much of the natural gas produced within the Commonwealth by spurring clean natural gas-related production through tax credits and grants to local governments. 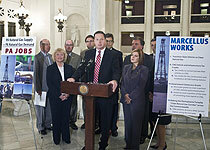 In an effort to ensure that more energy jobs are created in Pennsylvania, Rep. Tina Pickett (R-Bradford/Sullivan/Susquehanna) is lending her support of a package of bills designed to keep much of the natural gas produced within the Commonwealth by spurring clean natural gas-related production. The package, called “Marcellus Works,” focuses on clean natural gas and how that commodity can be used to further clean energy use throughout the Commonwealth. The package includes a series of tax credits and grants that allow the Commonwealth and local governments to lead by example by converting traditional gas-fueled vehicles to clean natural gas. This would apply to conversion of both public and private fleets and for CNG fueling stations. In many cases, these tax credits for private entities would piggy back on top of already existing federal tax credits. The grants would apply to municipal governments. Among the proposals unveiled at a Capitol press conference today, Pickett is sponsoring legislation to offer grants to municipal governments to convert vehicles to CNG and to improve infrastructure. The package also seeks to encourage mass transit to convert to clean natural gas or increase its use of CNG vehicles, and requires the Pennsylvania Turnpike Commission to install CNG stations at every other turnpike service station along the highway. “The potential for new and emerging jobs is within our grasp, and we need to take advantage of the resources we have available to respond to new technologies in the energy industry, such as clean natural gas,” Pickett said. Already, clean natural gas industries are sprouting up in southwestern Pennsylvania, and the commodity is considered to be environmentally friendly, when compared to traditional gasoline. The bills are expected to be formally introduced in the next few days. Video comments from today’s press conference are available by clicking on this link: or by visiting RepPickett.com.